This month I have been painting fairies. They are great fun to paint, great to let my imagination just flow with the Wax! Below are some of my new fairy pieces. 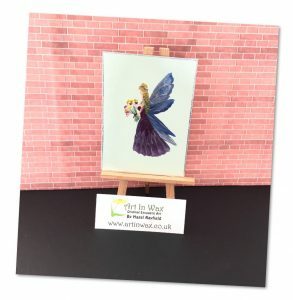 And you can also see how I put the finishing touches to this pretty “Flower Bouquet Fairy” which is just 2.5 x 3.5 inches in size. Watch me paint in miniature !! This week Adrian filmed me painting the finishing touches This fairy painting that is now for sale in my Etsy store. 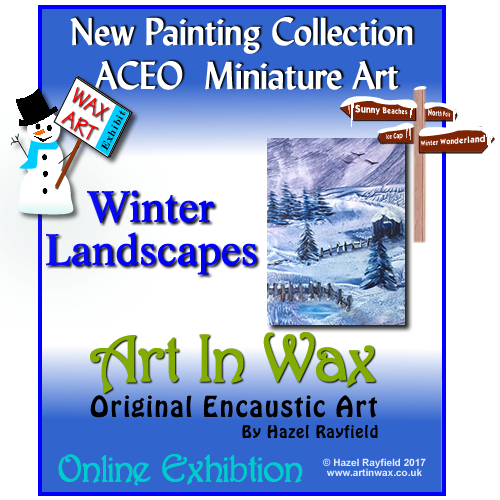 I have also shownthis film direct to my Art In Wax Facebook page and it has had lots of comments and views, I love to see how people create their miniatures so I thought it would be fun to show this little insight into how I paint. It’s been a while since we did any videos for the blog etc. But this year I hope to do more. I hope you enjoy watching, if you would like to leave me a comment that would be great ….. Following on from my previous post, 2018 sees some changes to the Art In Wax focus, bringing my miniaturist work to the fore. Nearly all my work is paintings miniature now, with last year seeing them go to more countries than ever before. At the last count my Art is in 17 countries on 4 continents. I have to pinch myself when I think about it. Who knew !! when I started painting Encaustic how my journey would be. It has been and continues to be my passion to paint miniature art in Encaustic hot Wax paints. I’ve been updating my website this weekend revamping the miniature art commissions page and as a result looking back at some of my sold paintings…… which reminds me …..
Maybe I should paint another a hot air balloon landscape, and perhaps a different style vintage caravan, I still love painting poppies, to think of something new for the seahorses, my “under the sea, dolphins and mermaids were popular a couple of years ago, but I haven’t painted any in a while…… I don’t know how I forgot them ! It seems at this time of year, the start of a new year with all the possibilities this will hold, that looking back is a fond occupation. 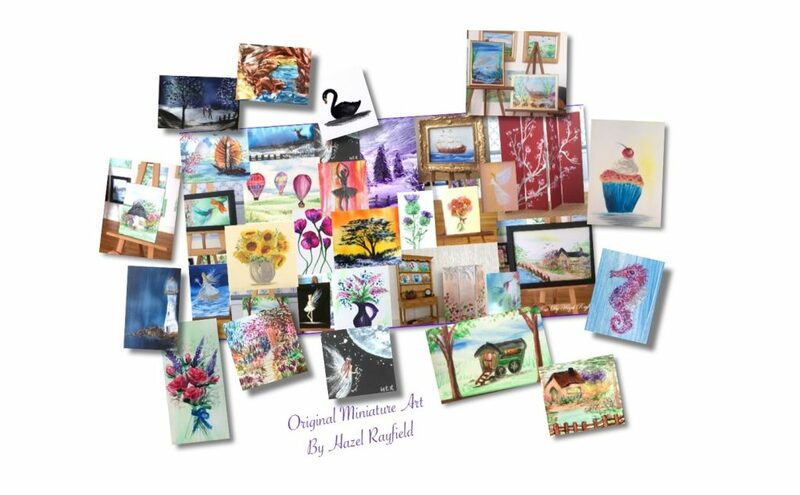 I have enjoyed looking at the commissions I have done in the past, not all these paintings shown in this graphic were commissions but they are all sold, and with that in mind. 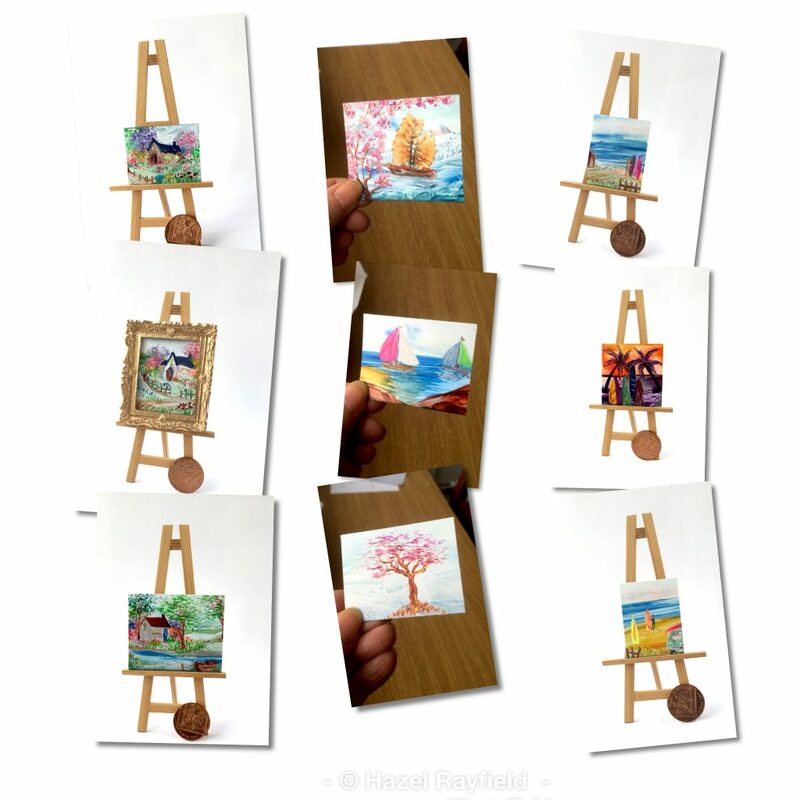 If you see a piece of my art that is sold but would like one similar, it won’t be the same as each piece is unique and original, then why not get in touch and see if I can paint a piece of miniature original art …. just for you. Commissions can be a single piece or a set of two or more paintings, the cost is dependant on your requirements and will be quoted together with my payment terms before the commission is started. They don’t cost much more than the paintings I have already online. I look forward to painting lots of commissions in 2018 ….. maybe one will be for you ? 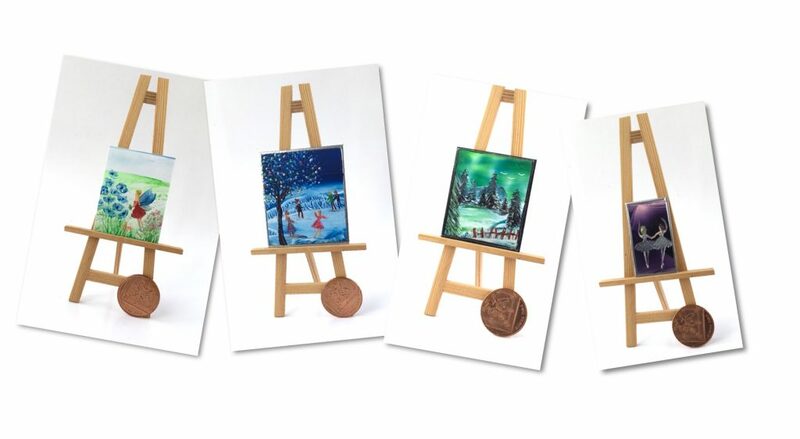 These are my latest miniature paintings which I have now listed in my Etsy store today. I have been painting this new miniatures over the past month ready to list online after the holidays so today they are now live and for sale. I ship worldwide from Southend England. 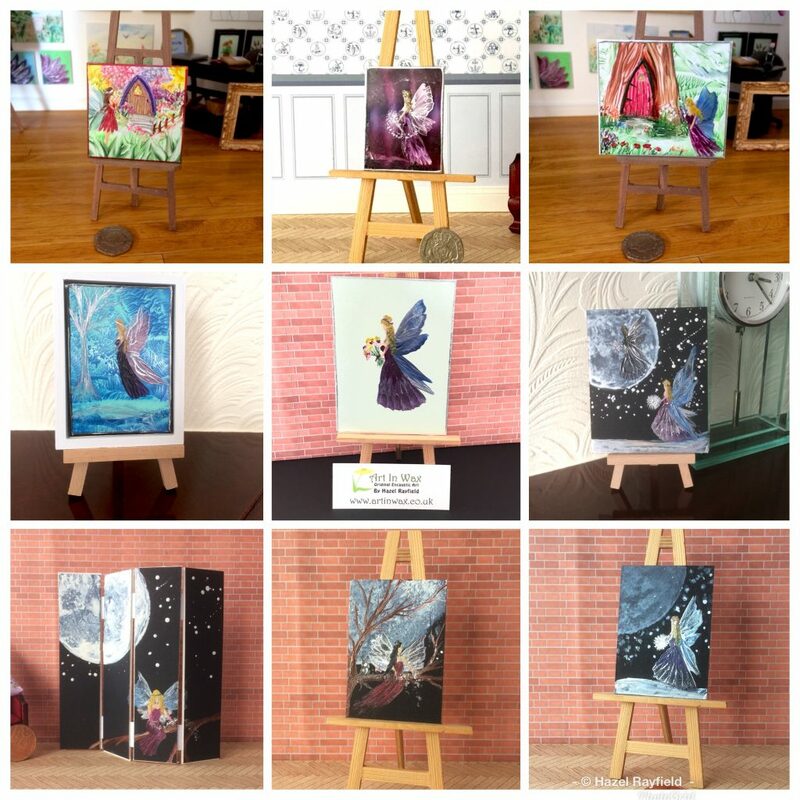 Some new subjects are included such as the surfer seascapes, plus the northern lights aurora borealis, ice skaters in a winter landscape and my cottage paintings are proving very popular and I do love paintings these and of course the fantasy fairies. To see more please pop over to Art In Wax on Etsy and don’t forget I paint commissions too. So if you like one of my paintings that is now sold, then why not commission a piece of my art, all my Art In Wax is original art, I don’t do copies / reproductions. My art is all original and painted using encaustic paints on specialist card supports.